Frank Brescia painting at Emmanuel Church. As Frank Brescia sat at his easel that day in March 2014, even he was surprised by the painting he saw. There was a wide-open, marine-blue sky. A tall yellow structure (“a silo thing”), and, in the foreground, a small white house. With a wall missing. He painted a few more similar paintings, each of them suggesting the transition between unhoused and unhoused, and he called them the “Skywall” series. He never imagined the impact they would have. One painting sold for $1,200 at the Boston Design Center. Another hangs in the Staples corporate office in Framingham. The Skywall image has been reproduced on posters, postcards, tote bags, and on cellphone covers. It’s “breathtakingly simplistic yet poignant,” said Stephanie Wright, chief curator of ArtLifting, who formerly worked with Christie’s, the auction house, in San Francisco. The precise details of Brescia’s story are vague, though some were confirmed in a telephone interview with Frank’s younger brother, Brian Brescia, of Milford, Conn. Frank grew up in a big house across from a beach in West Haven, Conn., one of five brothers. He studied chemistry in college and worked for Bayer Pharmaceuticals Corporation, doing research. Brescia is a slight, congenial man with a trace of an ironic smile, wearing a green pullover sweater and jeans. He describes his past with detail and self-deprecating humor, though some of the greatest triumphs and tragedies he recounts appear to be more dramatic than they are true. But his version of the story also includes clearly hard-earned accounts of homelessness, struggles with drinking, and, at present, he says, sobriety. 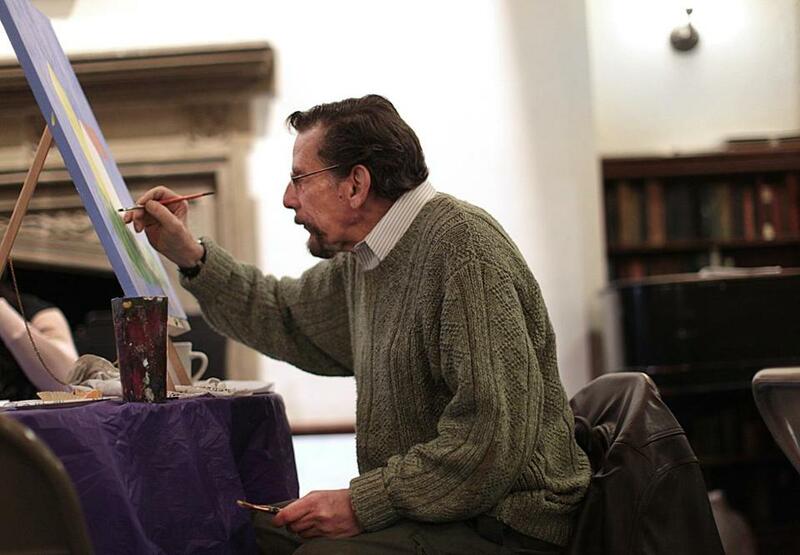 As he spoke, he was working on another Skywall painting at Emmanuel Church on Newbury Street. He paints here every Wednesday through a program called Common Art, which provides space and art supplies to homeless and low-income people. A few feet away from him, half a dozen men and women were sound asleep on the floor. It was an art therapist in Connecticut who convinced him to paint, he said. 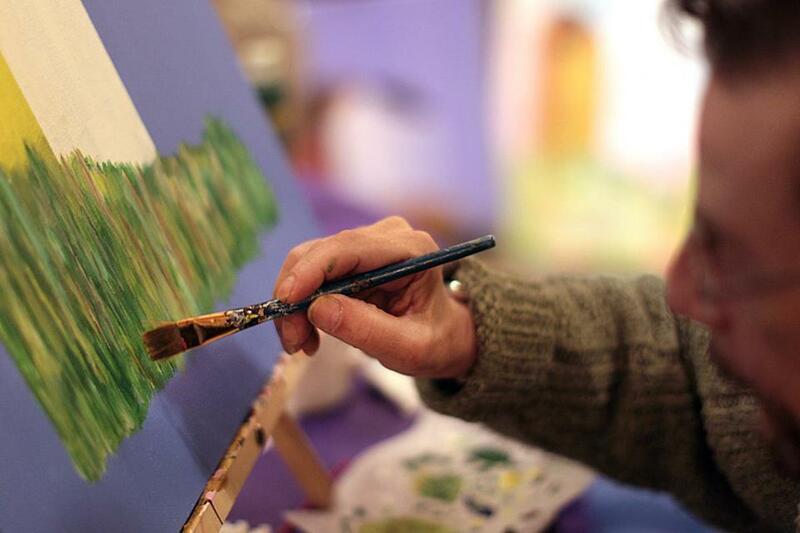 “The more I did it, the better I got,” said Brescia, who started out by painting landscapes. About 10 years ago Brescia moved to Boston, though he was unsettled for a time, living in a series of sober houses, at the YMCA in Cambridge, in an apartment in Revere. About five years ago he started working with Patti McCormick, a case manager at Justice Resource Institute, which helps marginalized people get housing. His challenges haven’t ended. “I don’t have the best liver in the world,” he said. There have been relapses and an eviction. In May 2014, he resorted to living on the street. It went on for eight months and was hellish, he said. He slept at Back Bay Station, on the Boston Public Library steps, in front of Old South Church. But he continued to paint, and one day about a year and a half ago, ArtLifting cofounder Liz Powers saw his work and recruited him for the ArtLifting program, which sells artists’ original paintings, art prints, and products. Artists keep 55 percent of the profit. He packed up a batch of walnut cookies he’d made the night before for his friends at the church. It would be a busy day. Later, he planned to go to the Museum of Fine Arts to see the Dutch painting exhibit. Brescia loves Rembrandt and Vermeer, and on a Wednesday night, admission would be free. 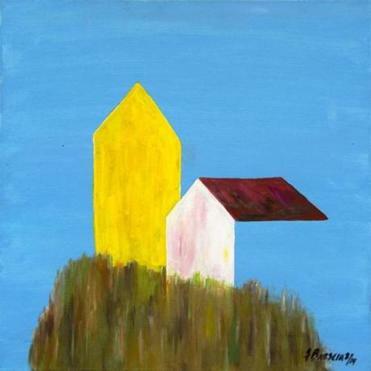 Brescia sells his work through a marketplace for homeless artists.